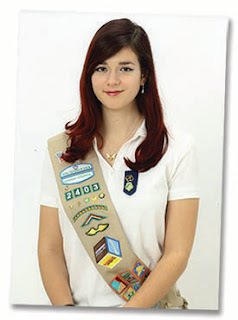 Girl Scouts of Nassau County (GSNC) is happy to announce that Julie Kapuvari was selected for one of Girl Scout’s highest honors, and was named by Girl Scouts of the USA as one of the “2015 National Young Women of Distinction,” for her Gold Award project, “Pollination Project: Don’t Bee Afraid, Bee-lieve.” for addressing the issue of Colony Collapse Disorder which affects the honeybee population. This special honor and designation by Girl Scouts of the USA showcases Julie Kapuvari’s extraordinary leadership over a project that had measureable and sustainable impact and addressed a global issue. Julie is a 2015 graduate of Massapequa High School and was one of only 10 young women nationwide to receive the award. Kapuvari discovered that since 2006, beekeepers have been experiencing major colony losses of 30% to 90% of their apiaries that were later attributed to Colony Collapse Disorder. This has been directly harming commercial beekeeping and pollination operations. Julie helped address this problem by becoming a beekeeper, conducting presentations for a variety of groups, educating them about the need for bee colonies and pesticide free environments. Julie’s colony is on an organic farm. The colony will contribute to its sustainability and productivity, while the organic farm creates a safe haven for the endangered species. Julie Kapuvari received a college scholarship from both the Kappa Delta Foundation and Girl Scouts of the USA. Each generously provided a $5,000 scholarship to all of the ten National Young Women of Distinction. This year, Julie received her Gold Award at GSNC’s Ceremony held on June 20, 2015. She will be honored at a national recognition ceremony hosted by Girl Scouts of the USA. She will also be featured in a livestreaming TED Talk–­­style event with her fellow National Young Women of Distinction. Both the recognition ceremony and livestream will be held on October 7, 2015, in New York. Earning the Gold Award is just one of the fun and amazing things girls can do as part of Girl Scouts. To join Girl Scouts or learn more about volunteering, please visit: www.girlscouts.org/join. 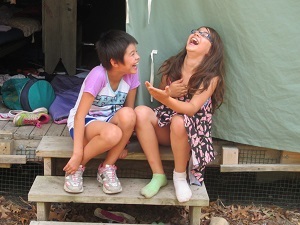 It’s a hot, August Summer day and the girls at Camp Blue Bay are all smiles excited for all the activities they have planned. For a first time visitor who never experienced camp as a child, I was excited to see what it was like and why parents would feel safe sending their kids to a sleepaway camp. 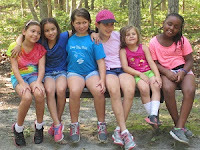 Camp Blue Bay, a beautiful property located in East Hampton, NY with many hiking trails and a private beach, opened my eyes about the camp experience and seeing the girls having so much fun is reason enough for parents to send their girls to Camp Blue Bay. Everyone at Camp Blue Bay was warm and welcoming, from the staff to the campers. Girls of all ages, Girl Scouts and Non-Girl Scouts, interacted with each other. Although it was hot out, the girls didn’t seem to mind spending time in their tents just talking, joking, and spending time together. Camp counselors were always close by ready to direct them to their next activity. While I explored the camp, I saw many types of activities going on like arts and crafts, sports, games, songs, swimming, and I can imagine much more. During these activities the girls always worked together and helped each other when needed. Each group of girls I encountered seemed to have developed a close bond, a good point to consider when thinking about sending your child to Camp Blue Bay. There was an overall safe and happy atmosphere throughout the entire camp and among all the girls. A safe-environment would be a major concern for me when sending my child to camp, but after visiting Camp Blue Bay I didn’t feel this is an issue at all. The camp director’s office, the nurse’s office, staff office, and dining hall are located near each other which is a reassurance for any parent. It is closed in and as you walk around the camp you will find girls in various areas either relaxing or participating in fun-interactive activities supervised by their camp counselors. Camp Blue Bay exceeded my expectations and gave me a glimpse of what a traditional camping experience would be like. The on-site director was very accommodating and made sure I felt comfortable at all times. 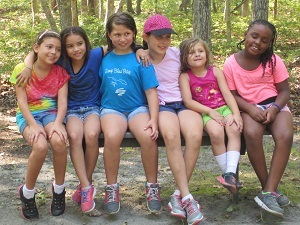 Camp Blue Bay provides a diverse camping experience for girls to make new friends, get away from technology and explore the outdoors, develop interpersonal skills, and most importantly, create lifelong memories.